The new St. Llàtzer School-College is located in the suburb of the same name in Tortosa. The project resolves the major change in scale between the Tirant lo Blanc Bridge and the low buildings in the suburb. 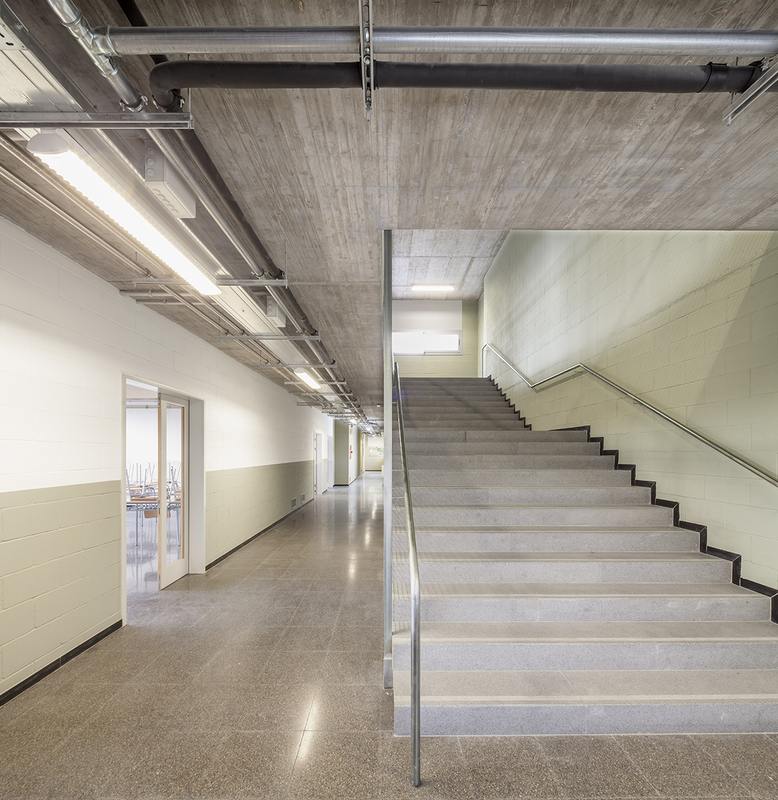 Given the site’s high flood risk and general humidity, the decision was taken to raise the school with respect to the terrain and use the suspended floor as the building’s ground floor. This gives the school a porch that organizes the circulation on the ground floor and provides protection from the climate. It also enhances the playgrounds through covered areas, which allow them to be used throughout the year. The project develops from the obligatory access point on its southern boundary and is organized along an axis that divides the site into two parts. The buildings are located to the west, thereby freeing up the space to the east for the sports field. The classrooms are laid out like a comb allowing all spaces to enjoy natural light. Only along the site’s northern boundary does the building go beyond the access axis, offering a full front façade that looks onto the street, thereby protecting the playground from the vehicular traffic. Within the rigid functional programme prescribed by the Department of Education, the highest quality spaces are the exterior ones, those of the covered playground. They are play spaces, where paved areas meet areas of gravel, and pillars alternate with tree trunks, generating attractive spaces that draw the users to them, protecting them from the fierce sun of the Terres de l’Ebre during the summer and offering shelter on rainy days. The classrooms from the primary school have large outdoor terraces, allowing the children to see out. At all corridor endings there is an entrance for the light. The school’s volumes are designed to be seen from below, from a child’s perspective. An exposed concrete underside combines with a green Sto façade and an upper section of white prefabricated concrete slabs. This combination of materials, together with the arrangement of the windows, lightens the composition and graduates the transition from the floor to the ceiling.